Located just 2 miles from Mercy San Juan Hospital, Sacramento Post-Acute offers post-acute services to patients in need of rehabilitation and 24-hour nursing care. Had a recent hip or knee replacement? Perhaps a loved one with a recent hospitalization requiring additional skilled nursing care? You have come to the right place! Our in house rehabilitation and nursing staff provide a full spectrum of individualized care designed to meet the needs of each patient. Sacramento Post-Acute partners with the Capital Medical Extended Care (CMEC) physician group. Led by Dr. Cheema, the CMEC is a multidisciplinary team of physicians and nurse practitioners brought on board with one goal in mind—to improve patient care while reducing the frequency of hospital readmissions. With regular visits by physicians and nurse practitioners, Sacramento Post-Acute is able to provide a level of medical care and service rivaled only by top hospitals. Sacramento Post-Acute has dedicated itself to high-quality care, short-term care in our 56-bed Skilled Nursing Unit. Along with great nursing care, we offer an in-house therapy program with staff that provides Physical, Occupational, and Speech Therapy. Our therapists are among the best in the area and will work with you or your loved one to achieve the best results possible. Along with traditional therapy workouts, we recently began a partnership with Accelerated Care Plus (www.acplus.com). This partnership allows us to provide specialized treatment programs and modalities that assist with pain management, range of motion, muscle training and healing. 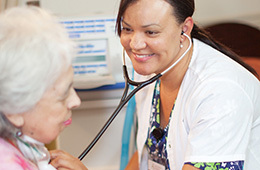 Subacute care is a relatively-new and rapidly-growing medical care service in America. It merges the sophisticated technology of a hospital with the efficient operation of a skilled nursing facility. Because subacute patients require more highly-skilled care, we use a team approach to patient treatment. Doctors, therapists, nurses and other health professionals all work in concert with the patient and his or her family to assure the most efficient care. We invite you to arrange a personalized tour and experience our commitment to excellence for yourself.